Archaeologists have uncovered the site of Britain's oldest house, the waterside home of nomad hunters dating back about 11,000 years. The dwelling, which has lake views, a thatched roof and very original features, predates the country's famous Stonehenge monument by around 6,000 years and was built at a time when Britain was still connected to continental Europe. Teams from the University of York and the University of Manchester working at the site believe the circular shaped home was built in about 8,500 B.C. next to an ancient lake at Star Carr, near Scarborough, in northeastern England. "This is a sensational discovery and tells us so much about the people who lived at this time," Nicky Milner from the University of York said Wednesday. "From this excavation, we gain a vivid picture of how these people lived." Discoveries made at the site suggest the house was about 11 feet, 6 inches wide, constructed of timber posts and likely had a roof of thatched reeds. The site was probably inhabited for between 200 and 500 years, and there were possibly several homes built at the site. Archaeologists have also uncovered a 11,000-year-old tree trunk, with its bark still intact, and found traces of a wooden jetty-like platform on the bank of the ancient lake that could be the first evidence of carpentry in Europe. The house is about 500 to 1,000 years older than a building in Howick, northern England, previously thought to have been the country's oldest home. 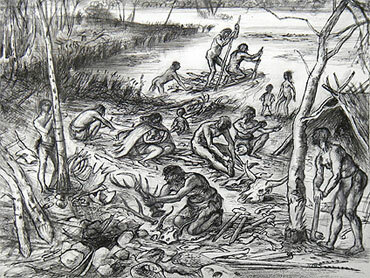 "This changes our ideas of the lives of the first settlers to move back into Britain after the end of the last Ice Age. We used to think they moved around a lot and left little evidence. Now we know they built large structures and were very attached to particular places in the landscape," said Chantal Conneller, an archaeologist at the University of Manchester. Artifacts found at the site - which include part of an oar, arrow tips and deer skulls - offer clues to the lives of the settlers. It's thought they kept domestic dogs, hunted deer, wild boar and elk, fished on the lake and had rituals that involved the use of headdresses fashioned from animal skulls. Science minister David Willetts said the building was an important discovery. "It brings out the similarities and differences between modern life and the ancient past in a fascinating way, and will change our perceptions for ever," he said. The Star Carr site, which dates back to 9,000 B.C., was first discovered in 1947. Archaeologists began work to uncover the house about two years ago.